Photographer and cyclist Nick Hand has created an atmospheric 'soundslide' (a combination of sound with pictures) about Brooks Saddles, a West Bromwich company who have been making leather bike saddles since 1866. 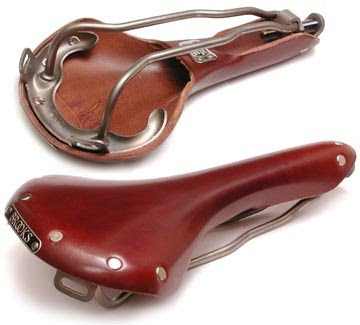 I have to declare an interest - or rather several interests - I own two Brooks saddles and think they are amazing, they are made in the Black Country and I love Nick's soundslides. The saddles are made of really high quality, and very thick, leather which take hundreds of miles to mould to the rider's sit bones. But once they do, they saddles are incredibly comfortable. Having ridden thousands of miles on mine, including consecutive days over 100 miles, I would personally swear by them (as would many endurance cyclists, or 'Randonneurs' as they are known). However you won't see many Brooks saddles on the Tour de France as they weigh many times what a modern saddle does! Are Women cyclists at more risk than men? Charity Bike Rides - A Waste of Time?